Thank you for choosing My Foldaway Mirror™. We are dedicated to your satisfaction and for your convenience, we have provided this Site Map. Thank You! Just pay a separate $6.95 fee for the BONUS My Foldaway Mirror™! 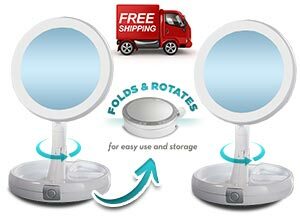 Buy My Foldaway Mirror™ today for just $19.99 and we'll DOUBLE the offer and send you a 2nd BONUS My Foldaway Mirror™, just pay a separate $6.95 fee! Your entire order will include FREE SHIPPING! ©2019 My Foldaway Mirror™ All Rights Reserved.